Review: Based on a true story which took place in 1952. Two young Argentines, Ernesto Guevara and Alberto Granado set out on a road trip to discover the real Latin America. 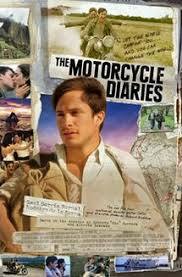 The original title for this film is Diarios de Motocicleta. One incredible awe inspiring true story. The landscapes that the two guys travel through are quite astonishing. It is quite hard to imagine nowadays what it was like to travel in the 1950’s which was still then pretty much wilderness and certainly no roads. Amazing to see and witness places such as Argentina, Chile and Peru. The director does a fantastic job bringing the whole film to life. I felt I was travelling and was with them through the whole of their journey and experiences. Apparently Gael Garcia Bernal has already played the character Ernesto Guevara before in a 2002 TV mini-series. In this he is utterly convincing and energetic. Ernesto Guevara’s diaries were only discovered years after he died, they were found in a knapsack. The two main themes from this film are friendship and solidarity. At the Academy Awards in 2005 this won an Oscar for Best Achievement in Music Written for Motion Pictures, Original Song. At the Bafta Awards in 2005 this won for Best Film not in the English Language. Also at the Bafta’s Gustavo Santaolalla won the Anthony Asquith Award for Film Music.